Setting aside the Jade tea for awhile - it is reported to brew satisfying tea for several days - Tim challenged me to a kung fu face off. 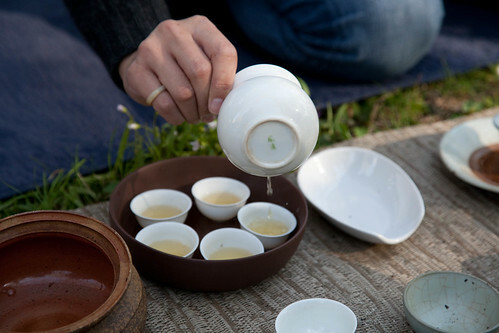 He doses out the tea into small bowls and we each build our own pot carefully layering crushed and whole leaves. He is a bit more delicate than I, and manages to build a denser pot in the first round. 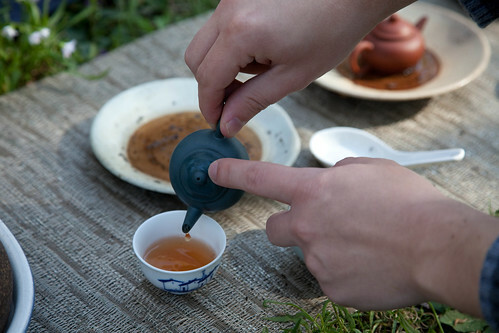 This makes his brew more reminiscent of an espresso, while my pot revealed more floral notes. 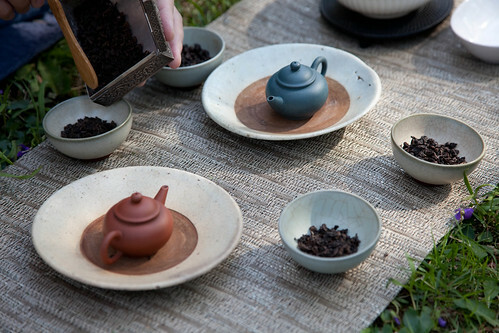 We used the tiny pots to densely pack the leaf in without wasting any precious tea. To serve all of our guests, we both double brewed, or mixed two subsequent brews in the serving cup for each round. The fragrance at the bottom of the serving cup was intoxicating all on its own. Each guest was served a tiny cup of each, and in keeping with tradition, we limited this to 3 servings. Dan Cong seemed to fit the weather perfectly, if not for a few technical problems. 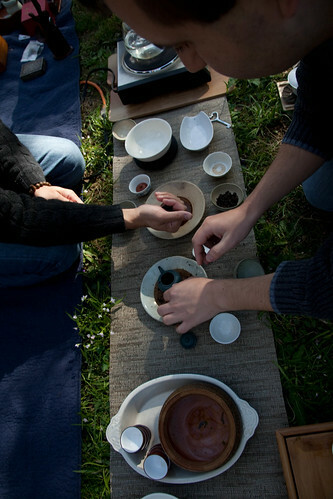 We finished with a Dan Cong brewed by Tim, but the sun had started to sink in the sky and the air grew chilly. 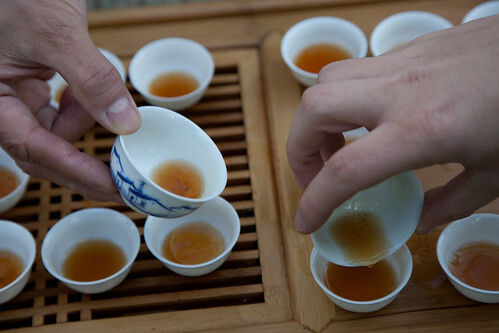 With the cups cooling so quickly, it was difficult to catch the fleeting aroma of the Dan Cong. It was a fantastic drink and a good end to the day regardless.